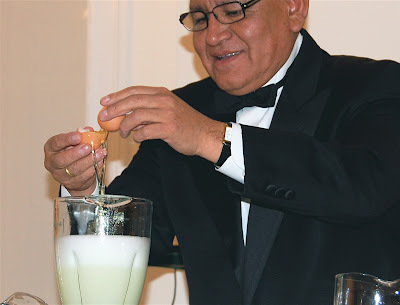 Marcelo Lazaro, head bartender at the Embassy of Peru, cracks an egg while demonstrating how to make a traditional Pisco sour. Despite the icy sidewalks and chilly temps on Monday night, the whir of a blender and the smell of fresh lime juice inside the Embassy of Peru had me daydreaming about balmy tropical locales. 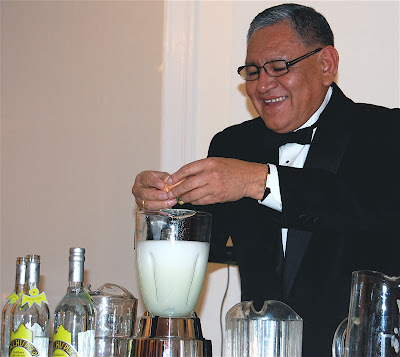 The embassy's bartender, Marcelo Lazaro, was whipping up a batch of Pisco sours for a crowd of onlookers. The event, co-hosted by Macchu Pisco, was in honor of Peru's National Pisco Sour Day, coming up Feb. 6. After Lazaro demonstrated the classic recipe — a 3:1:1 ratio of Pisco, lime juice and sugar, plus egg whites and Angostura bitters — eight DC bartenders showed off their twists on the cocktail. 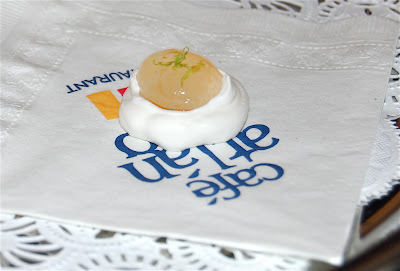 Jen Fitzsimmons of Café Atlantico made the bite-size version pictured above: an egg white meringue topped with spherified Pisco and lime zest. Alex Bautista of Ceiba showed off a passion fruit Pisco sour, and Jon Arroyo (Founding Farmers, Farmers and Fishers) added jalapeno, strawberries and cracked pepper to his. With this weekend's snow storm set to blanket DC (again), I highly recommend mixing up a batch for your own toast to Peru's National Pisco Sour Day. I swear it'll make you feel warmer.